Animals may think they own the planet now, but it wasn’t always so. Earth is 4.5 billion years old, but the first animals appeared no more than 600 or 700 million years ago. For most of the remaining time, the planet was ruled by microbes. But based on new fossils from Africa, something large-ish was apparently crawling around in the muck 2.1 billion years ago. And if it wasn’t an animal, what was it? To understand what might have been going on here, it's necessary to understand a little bit about early Earth. Life evolved shortly after our planet formed. But for a very long time, all organisms remained tiny. Earth’s atmosphere was very different then. It contained no oxygen, and without the metabolic power made possible by raw O2, it was difficult to grow large. Then, a cataclysm occurred. The Great Oxygenation Event took place sometime around 2.4 billion years ago. The details remain fuzzy, but it was likely the result of the invention of photosynthesis by cyanobacteria. Photosynthetic creatures can manufacture their own food from carbon dioxide and water powered by 100% free sunlight. The “waste” product of photosynthesis is oxygen. Initially, methane in the atmosphere and iron in the land and ocean soaked up excess O2 creating huge rust deposits still visible today called banded iron formations. But eventually, these buffers were exhausted. Oxygen accumulated in the air and nothing on Earth was ever the same. For starters, oxygen was toxic to the vast majority of existing life. A great dying occurred, along with the first and possibly longest of the Snowball Earth events in which our planet iced up for 300 million looooooong years. It was Earth’s adolescence. And Earth was having a rough time. Eventually, life evolved that could tolerate and even capitalize on oxygen. With access to the energy-rich biochemistry made possible by oxygen, life could get big. The organisms that learned to use oxygen include our own ancestors. We reap the reward of their discovery with every breath we take. Just at the end of this time, around 2.1 billion years ago, the string-like fossils displayed in the animation above were deposited in what is now southeastern Gabon. 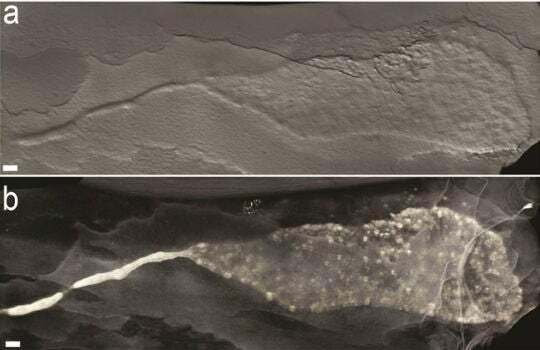 They were part of a large group of fossils of other large life forms collectively referred to as the Francevillean biota made possible by a temporary burst of atmospheric oxygen. These organisms lived in the seabed under shallow water near shore, and these beds were, unsurprisingly, oxygenated. The shallower of the deposits were home to stromatolites, wedding-cake like confections of bacteria and stone. The string fossils were deposited in slightly deeper water. The strings, fossilized mainly in pyrite, measure up to 6 mm (1/4 inch) across and up to 17 cm (7 inches) long. Near the string fossils are the remains of what appear to have been microbial mats, places where bacteria were growing in pastures en masse. The strings are usually straight, unbranched, and remain within a single bedding plane. However, the diameter of the tunnels fluctuates down their length. Most of them have a rounded end, but one has a suspicious spherical pyrite object at its tip. Some strings execute lazy bends or sharp turns. In one of the fossils, a sheet appears to coalesce into a string. What could account for these features? If created by something like an animal with a solid body, one would expect the strings’ diameters to be constant (and also for them to be 1.5 billion years younger). But they are not. The team checked the strings against similar structures formed by purely physical processes from pyrite, but concluded their composition, shape, and texture are different. Another possibility is that the strings are body fossils of filamentous bacteria like the sulfur-oxidizing bacteria Thioploca or Beggiatoa alive today. But the size is wrong. Such bacterial bundles are usually no more than half a millimeter in diameter – much smaller. On the other hand, the authors say, the shape of the strings and their relationship to their rock matrix are reminiscent of structures created when mucus pyritizes. Such trace fossils – structures made by the movement of living organisms, but not the organisms themselves – tend to be more massive, branching, and incorporate junk from the environment. Many creatures alive today make slime trails. But only one group of such creatures – or something like them -- might plausibly have existed during this time period. That would be the cellular slime molds. These bizarre creatures are made of amoebas that feed on bacteria and live independently for most of their lives. But when they run out of food, they assemble to form a super creature called a “slug” that, though it is made of thousands of individuals, moves and behaves like a simple animal that leaves a slime trail in its wake. The fossil that appears to show a sheet coalescing into a string suggests this possibility, as does the varying diameter of the strings, which could reflect an organism with an open-minded attitude toward body shape. Some of the string fossils appear to intersect and fuse with each other, just as slime mold slugs occasionally do (when you’re already made up of thousands of individuals, what’s a few thousand more?). Conversely, cellular slime mold slugs sometimes split, a phenomenon called twinning. Many of the strings also appear to move in parallel. Modern slime mold slugs move in response to simple environmental gradients of ammonia, temperature, and oxygen in their quest to reach the soil's surface. If these were indeed ancient "slime molds", they may have likewise been responding in tandem to simple gradients of some kind. The microbial mats fossilized near the strings were abundant and regularly spaced, the authors say. Such mats could have been both food sources and oases of oxygen, even at depth, if photosynthetic organisms were able to capitalize on what light filtered down to them. In modern seabeds, oxygen concentrations in biomats may be 4 times higher than in the overlying water column, highlighting both the resource they represent and the basis for a chemical gradient that could have betrayed their location to observant predators. The story the string fossils may thus be telling is one of amoeba-like microbes feasting on microbial mats buried in the sediment, who, when they run out of food, convoy to the next pasture. In modern cellular slime molds, the bigger the slug, the faster it travels. Ancient slime molds may likewise found that by teaming up, they could more quickly and efficiently raid bacterial villages, much the way Norse marauded medieval Europe with the help of their Viking ships. There are some differences between these fossils and modern cellular slime molds, however. Modern slime molds are much smaller than the putative fossil slime molds. Though these strings were, as mentioned, around 6 mm across and up to 17 cm long, the typically-sized modern cellular slime mold Dictyostelium discoideum measures only 0.2 mm wide and 1-2mm long (yet are still capable of migrating up to 7 cm vertically). In addition, all modern cellular slime molds live in soil, not sea sediment. Putting size and habitat together, it seems unlikely that modern cellular slime molds and whatever made these ancient strings were directly related. Rather, the authors suggest that some unidentified ancient amoeba-like organism evolved to behave in a very similar fashion. They did not meet a happy end. Soon after these fossils formed, atmospheric oxygen plunged to levels near the lower limit for complex life for another billion years. That probably terminated these ancient, enterprising slime molds, one of Earth’s first experiments in macroscopically mobile life. El Albani, Abderrazak, M. Gabriela Mangano, Luis A. Buatois, Stefan Bengtson, Armelle Riboulleau, Andrey Bekker, Kurt Konhauser et al. 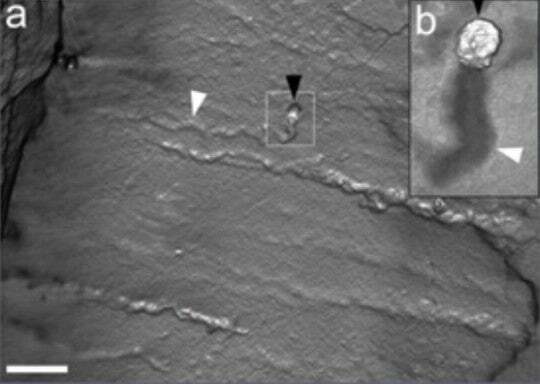 "Organism motility in an oxygenated shallow-marine environment 2.1 billion years ago." Proceedings of the National Academy of Sciences 116, no. 9 (2019): 3431-3436.